My Facebook friend, David, chose my comment below as his Facebook Quote of the Day. When the right mentions class warfare, many so-called liberals shrink from the term, but what they should say is, "You're damned right it's class warfare. The top 1% are making war on the rest of of the country, and we need to stop them." I'm honored that David chose my comment as his QotD. As an excuse for self-promotion, I want to say a few words about the Occupy movement. 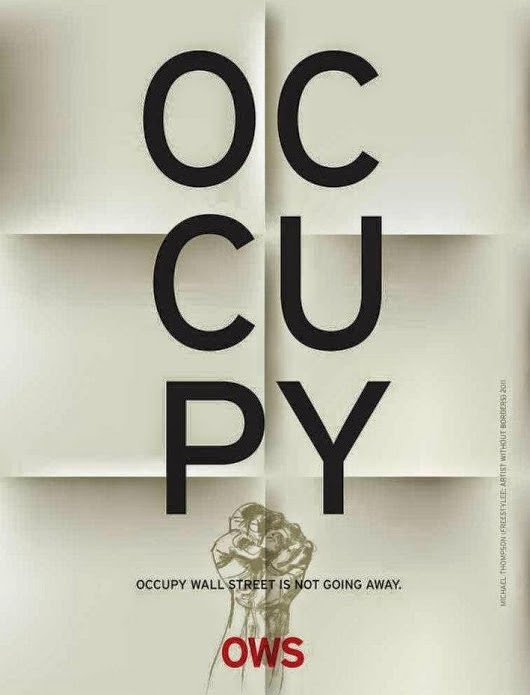 Far too many of us see Occupy as a failure, but I do not agree. Occupy awakened a good many of us to focus on the 1%, the very wealthiest in our society, and their disproportionate ownership of capital, even as the group drew attention to the flim-flammery of banksters and financiers who played a large part in plunging the country and the western world into the Great Recession, the worst economic disaster since the Great Depression in the last century. In my history book, the Occupy movement did not fail but rather succeeded in changing the conversation to call attention to widening inequality in the US, thereby influencing the electorate to vote for a second term for Obama and to hold the Senate for Democrats. By a near miracle, the Affordable Care Act became law and provided health insurance for millions of citizens who were previously uninsured. We sometimes miss the success of movements and policies that seem to us as failures in the short term, but, in the long term, are proved to have great influence for good. Excellent column by Paul Krugman in the New York Times. President Obama and congressional Democrats hold the cards since the election. Let's hope they play the game to the advantage of the great majority of the citizens of the country. Keep in mind that the fiscal cliff is not that at all, but is rather a fiscal incline, and, if it comes to that, the slide down the incline will play a lot worse for Republicans than for Democrats. As for Thelma and Louise, they landed safely and moved to Mexico. Drawing clear battle lines for next year's elections, a combative President Barack Obama on Monday demanded that the richest Americans pay higher taxes to help cut soaring U.S. deficits by more than $3 trillion. He promised to veto any effort by congressional Republican to cut Medicare benefits for the elderly without raising taxes as well. "This is not class warfare. 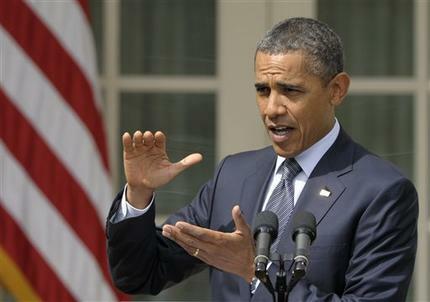 It's math," Obama declared, anticipating Republican criticism, which was quick in coming. Now if only President Obama and the Democrats hold the line on the taxes in the plan. And I want to know more about the details of the cuts to Medicare and Medicaid. The Republican reaction was swift and bluntly dismissive. "Veto threats, a massive tax hike, phantom savings and punting on entitlement reform is not a recipe for economic or job growth-or even meaningful deficit reduction," said Senate Republican leader Mitch McConnell. "The good news is that the Joint Committee is taking this issue far more seriously than the White House." If the Republicans want to call it class warfare to ask the very richest people in the country to pay their fair share in taxes, that's fine with me. Right now the poor and middle income folks are losing the class war, and it's time to fight back against the greedy people and their supporters in Congress. The president's plan won't make it through Congress, but - Damn! - the Democrats will have a decent issue to run on in the coming election. Thanks to greywolfe359 at Daily Kos via Mark Harris at Preludium. If you didn't get a chance to watch President Obama's address on fiscal policy yesterday, you might be better off. It was nothing more than a partisan campaign-style speech that doubled down on raising taxes. What the president has failed to realize is that the problem isn't that our taxes are too low – it's that the current spending habits in Washington have created a recipe for disaster. The answer is not increasing taxes or perpetrating ugly class warfare, but to make bold spending cuts so we don't leave this fiscal mess for our children and grandchildren. Increasing taxes during this economy would seriously hurt America's job creators. I watched the speech, and I thought the president's suggestion that the rich pay their fair share of taxes for the privilege of living in this great country was one of the best parts of the speech. I also noted that the president placed the blame for blowing the budget squarely where it belonged, on the tax cuts for the rich and two off-budget wars that were never paid for during the presidency of George Bush and his Republican cohorts running wild, including you. 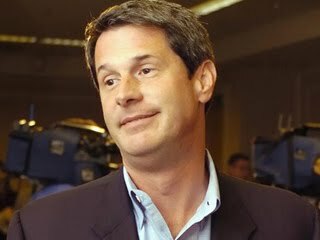 You have a nerve, Sen. Vitter. Do you think I'm stupid? And if asking the richest amongst us to pay their fair share is "perpetrating ugly class warfare", then I quote George Bush and say, "Bring it on!" BUFFETT: Yeah. The rich people are doing so well in this country. I mean, we never had it so good. BUFFETT: It's class warfare, my class is winning, but they shouldn't be. The interview took place in 2005! The inequities are even greater today.